This is the summary of consumer reviews for Boon Frog Pod Bath Toy Scoop,Green. 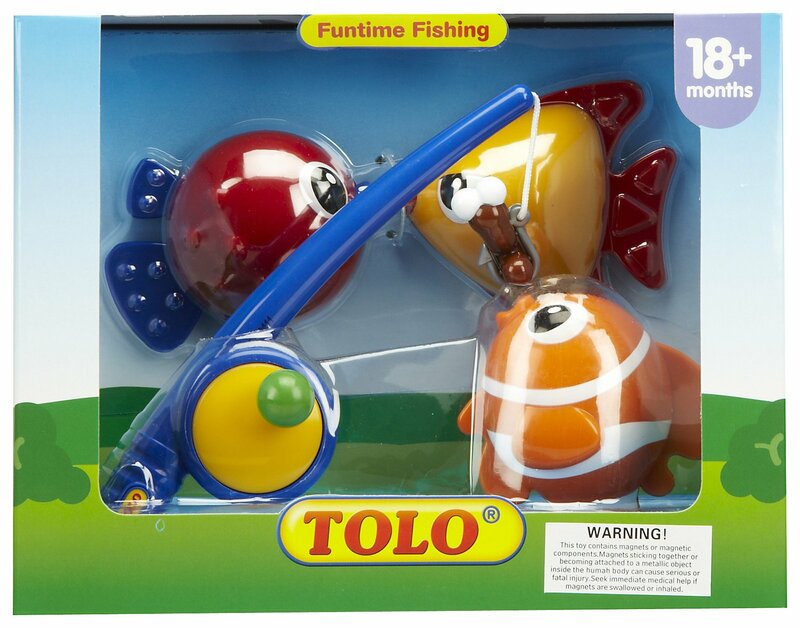 The BoolPool rating for this product is Good, with 3.90 stars, and the price range is $23.12-$34.99. 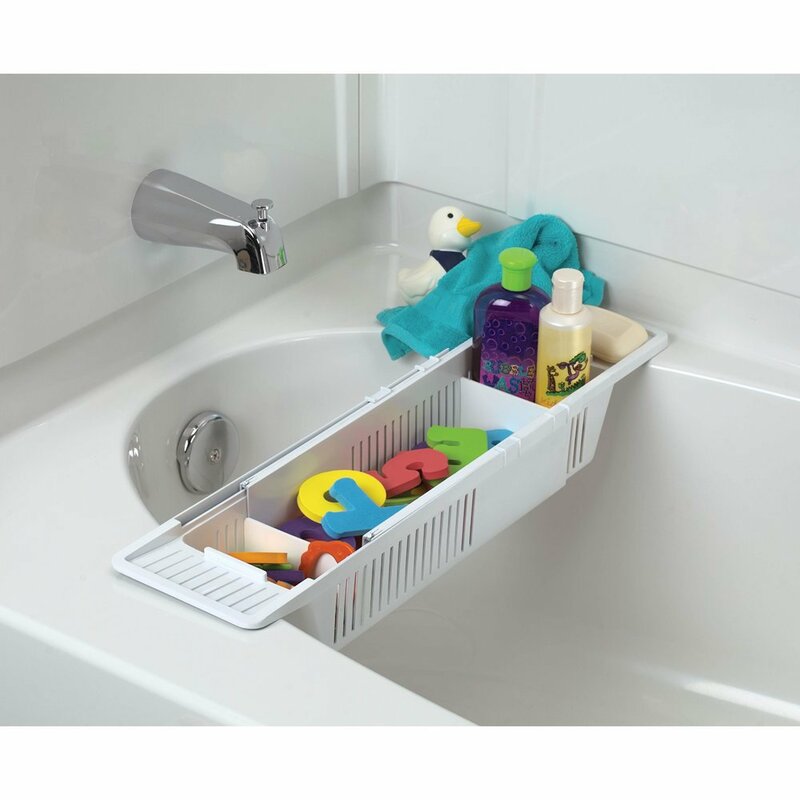 The Boon Frog Pod Bath Toy Scoop keeps your bath organized and tidy. Its drainable scoop lets you gather and rinse toys, which helps prevent scum and mildew issues. The wall mounted base, with built-in shelf, holds all your essential bath products. And it really sticks to bath walls with semi permanent adhesive strips, but does not harm tile or wall surfaces. It is fairly easy to install, use and attractive for children. However, some users find this to be bit expensive for the quality and value provided by this product. 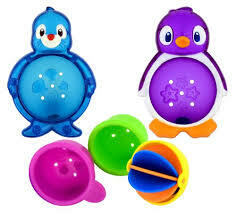 Overall, the Boon Frog Pod Bath Toy Scoop is a great product for storage of bath toys and accessories. 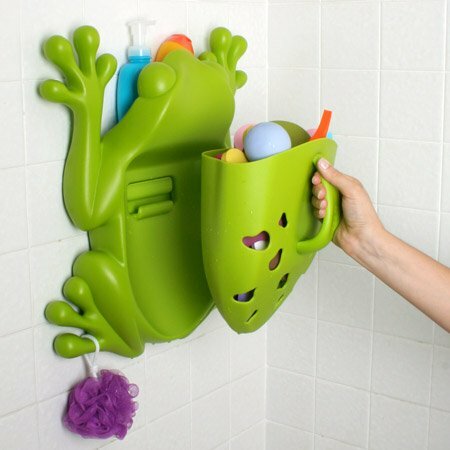 Once it's really on, the frog pod provides handy, stylish, and mildew-free bath toy storage for a good long time. It is highly liked and recommended by users. Holds plenty and has stayed mounted on our tile wall for the past 5 months with no problem. We love our Frog Pod, and it does stick to the wall! Very easy fix, and no screw holes in the wall for a permanent mount!. It fits a ton of tub toys & I love the shelf on top for soap bottles. A friend of mine has had this stuck to her bath tub wall for 2 years and it holds a fair amount of toys, so I got one for myself. This thing is like super glued to my bathroom tub wall with those stickers they provided. I made sure to attach it to a CLEAN and DRY surface on the shower wall and it's been perfect!. I loved the idea of keeping two childrens' toys, soap, and misc. I used (4) 3m command velcro strips to mount the frog - hangs on the wall above the tub perfectly. But like the other reviews said it kept falling off the wall. It came with adhesive strips and a suction cup mount. They should include a suction cup option. I e-mailed Boon Customer Service and they sent me a suction cup mounting plate. I used the suction cups to apply. Called the company and they sent me the new suction cup mount and instructions for the suction cup and for the screw in as well. Instead of the double stick tape, this one attached with several small suction cups. I went out and bought the netted one with suction cups for $5.00 and that works perfectly. In the end, I used the suction cup attachment. Let me tell you, the suction cups are very strong!! I tried rigging the screw plate to fit my own suction cups.. 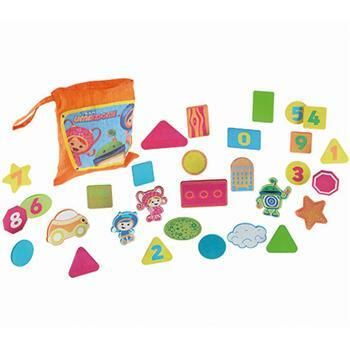 Product works to organize bath toys. I thought maybe I didn't follow the directions properly or overloaded it with too many toys, so I hung the product again, following the directions exactly and only putting in a few of my child bath toys. 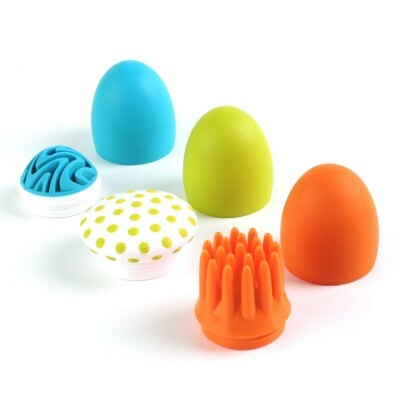 The product itself is well made and really cute. 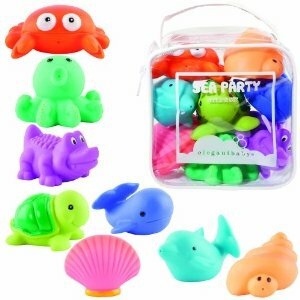 I was really excited when I found this product as I've been looking for a tub toy organizer for a long time that doesn't take up too much space and that can hold lots of toys. 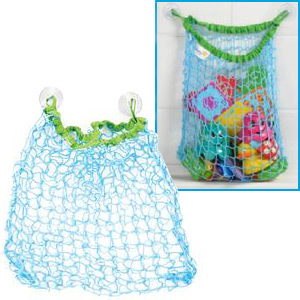 I bought this product after getting tired of picking up the mesh bag of toys laying in the tub. The boon holds lots of toys and it's easy to use. There are two methods of installing the product, screws and a kind of sticky glue strip . Since I rent, I was unable to drill holes in the tile grout to install the product. I think people get hung up on not following directions and then blaming the product. It stored a lot of her bath toys, holds her shampoo and loofa and no more standing water in her toys. Aside from being incredibly cute, it holds a lot of toys, easy to install, and makes bath clean-up very easy!. The frog holds plenty of toys and even has a nice shelf for products. I expected it to be bigger doesn't hold much for toys. The container holds only tiny bath toys and ones that are squishable. The bucket on the frog has ample space to hold all the toys that my son has plus room for more (and we've LOTS of toys). It holds a good bit of toys and I like that it's a shelf at the top where I store large bottles of baby wash and shampoo. It holds a ton of toys and it's so easy to scoop all of them up after bath time. This bath toy scoop works great for getting all of my son's toys out of the water and drying them in no time. I'd recommend this scoop and storage to anyone who spends a lot of time chasing little floating toys around your child's tub.